Friends are just too sweet!! Have date with chelle & shinz today. Chelle came later cause she is working. Girls outing sure got pictures. Me and shiz walk around before michelle come. we met up with yonghui, guanwei, & angelyne. If only I have her height. haha. I know yong hui is hoping for that too. I got a new top. writing. I brought some accessories too. Shinz got a pair of heels from NOSE. But I will fall if I wear such high heels. We went ADD-ON after eating with those guys. & I saw a cute guy working there. ish. he should come work earlier. lol. Joe & Dylan was nice enough. When they know I broke up with boyfriend. & so they spent me STARBUCKS. Michelle reach on bout 3.30pm. 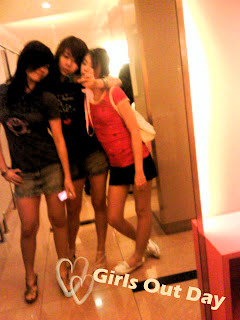 and we realize all three of us wearing denim mini skirt with a T-shirt. Walk around and camwhored abit with her. She is so freaking small sized. Shinz & me therefore decided to adopt her as our daughter. I got myself a pair of wedges. about 4.45, we left michelle. she go on dating with her guy after we leave. When we walking out of Pyramid. 2 Blackie. Those african people came to us. They talked to us & asked for my number. which is my big big mistake. I like hanging out with friends. & Thanks guan wei for fetching us home.